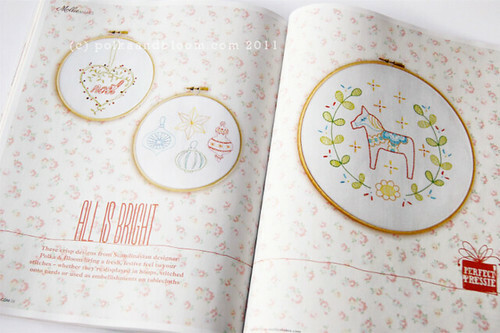 I'm very excited to tell you that three of my patterns are in the new issue of Mollie Makes magazine! And they made them look sooo good, the Mollie Makes peeps definitely know how to make things look Just So. Unfortunately, the (lack of proper) light here today means my photos of the magazine aren't showing it in all its glory. But believe me, it's pretty! The magazine also has loads of other pretty projects and articles, so it's definitely worth getting hold of a copy! But wait! There's more! A give away! Three different prizes - three winners! One set of the three patterns. - I'd like to give this to someone who's not in the UK, so please tell me where you are in the world. With the magazine also came a rather pretty wall calendar. We're not that into wall calendars here chez Polka&Bloom, so I'd like to give the calendar, from the copy I bought myself, to someone who is. To enter: leave a comment on this post with your email address, so I can get in touch with you. Give away ends on Sunday, November 27th. The give away is now closed. Thank you for all your comments. The winners will be announced in the next post. (Also on my proflile) Nice giveaway! Ohhh!! I don't think we'll get the Christmas Mollie Makes in time here in Canada, I think we're two issues behind :( So I'd love it! Thanks for the offer!! Congrats on being in the magazine too!! Wow, I'd love to win! You make so beautiful embroidery. I'm in Denmark and would also love to win the magazine. What a lovely, lovely Thanks-giveaway! So glad that your work has been featured in Mollie Makes! So exciting! Great giveaway! Congrats for the magazine feature, the article looks really pretty. I'd love to enter the giveaway please. I own one precious issue of Mollie Makes and I love it. 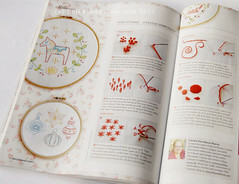 congratulations carina on getting your patterns in the magazine! Love your embroidery work! Thanks for the opportunity to win :DD I live in Oregon. I just love your patterns. Thank you for the chance to win the set publish in the Mollie Makes. Love your patterns! And the wall calendar! I love your patterns. Thanks for the chance to win this wonderful giveaway, it's a big christmas present. I'm a spanish girl for Barcelona. Carina, it is so exciting to see your work in Mollie Makes like this; congratulations on your well deserved exposure! And thank you for the opportunity to win a copy of the magazine. I would love to have a copy of that book. I haven't seen it here in the US. Oh how exciting for you. And it IS a big deal to get your stuff in a magazine. They probably get hundreds of submissions to choose from so having yours be chosen and then to have THREE chosen, congratulations. That's huge in my mind. And they're beautiful too. Congrats! That is super exciting for you! Oh man, your patterns are super pretty, and seeing them in that spread is just perfect. They belonged there. This is the first I have seen Mollie Makes (I'm in the US) it looks amazing. Congratulations on being published. And I would love to get that wall calendar off your hands. I would love a copy of the magazine and it's too it's not available in my city. I'm in the US so I've never seen Mollie Makes, I'd love to be a lucky winner. Thank you! I love your beautyfull pattern, I just got my eyes up for embroderi, and i wil be happy to winn some pattern. Ooh what a lovely magazine! I'm in the UK. How exciting for you! Congrats on your feature in this scrumptions looking magazine!!!! I'm in the USA and have not seen this magazine before. I wonder if it'll head over this way anytime soon? What a generous giveaway -- and how wonderful to be featured in Mollie Makes! Congratulations to you! I have heard of this magazine, being a big reader of blogs, but have not seen it, probably because I'm in the U.S. Thanks for the chance to win! So very pretty! Charming. I'd love to get stitching on these darling patterns. What a wonderful giveaway. I really enjoy your patterns and the wonderful colors you use. Lovely giveaway and I love your work! Looks beautiful. Never tried to stitch, but your patterns (especially the bright colors) make me think about it! Usually I crochet or sew. Stitching could be a wonderful addition to my projects. What a wonderful giveaway. I love your patterns and I've been drooling over posts that talk about Mollie Makes because I'm in Florida and we don't have that fabulous magazine here in the U.S. Thank you for an opportunity to win. I love your blog and have been inspired to get stitching again. Excellent looking spread! Congratulations! Thank you for the chance to win. I am in Maine in the U.S. So pretty! I'd love to win! I'm in the US. I love your patterns. I've been looking out for Mollie Makes here in Brisbane (Australia), but so far no luck. I have toyed with the idea of subscribing, but that is very expensive outside Europe. Thanks for the giveaway! Hi Carina! Congratulations on being published in Mollie Makes. From the glimpses I've seen in Australia of this magazine, it is very hip and happening. What an honour to have your work in their publication. You must be very proud! I have followed your inspirational blog for quite a while now, and love your whimsical designs. Best wishes, Ros. Congratulations on your patterns in Mollie Makes!!! I've never seen the publication before. Your patterns are just too cute and thanks for a chance at a great giveaway. I live in Michigan, USA. How exciting! I would enjoy any of these giveaways. I'm in Ohio and have never seen a copy if this mag. Wow, your pretty designs in Mollie Makes, great! Congratulations! And oh yes, of course I would love to win one of your prizes... I am in Canada. I'm in the US, and I'd love to win. adaiha at gmail dot com. 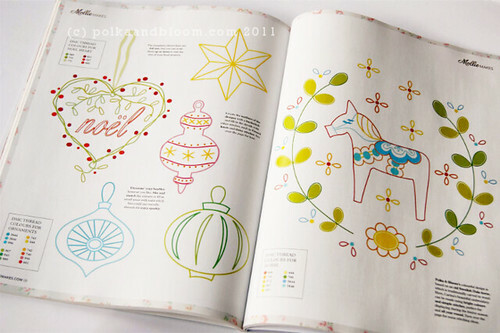 Hi, I saw your work in my digital issue of Mollie Makes and fell in love love love. I would love to win either the patterns or e paper copy of the magazine since I can,t use the Digi patterns. I am new to embroidery and ink see would make lovely Xmas pressies! I am in the US, my email is sweeney (dot) susanna (at) gmail.com.